Seiberlich and Mason interviews are mixed in the audio files and transcripts and must be sorted and edited to separate them. Sandra Schermerhorn: This is Sandra Schermerhorn. It is August 10th, 2006; I am in San Diego, California, talking with Lawrence, (Larry), Seiberlich Sa Bom Nim, and Sa Bom Nim Seiberlich, could you tell me where you live now, and where you flew in from? Larry Seiberlich: I live in Maplewood, Minnesota, I lived in the Twin Cities almost all my life. Sandra Schermerhorn: I see, and your Dan number and your current instructor? 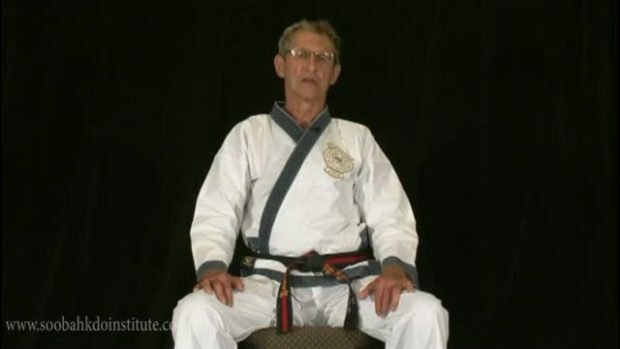 Larry Seiberlich: My current instructor is Kwan Jang Nim, and my Dan number is 1815. Sandra Schermerhorn: And do you own a studio now? Larry Seiberlich: I have a studio which was established at the beginning of the federation, Studio #7, Minnesota Tang Soo Do Association, but actually I only teach my students who are all master instructors. Sandra Schermerhorn: Oh, I see, and where is your studio located? Larry Seiberlich: It’s in St. Paul, Minnesota. Sandra Schermerhorn: I see. And can you give me just a little sketch about who you are in terms of your education, employment, family, hobbies, any one or all of those. Larry Seiberlich: I’ve been involved in a lot of different areas of athletics all my life. I have also trained law enforcement personnel for 35 years; I have trained government forces. Larry Seiberlich: Defensive tactics, guerrilla tactics, firearms, special operations. Sandra Schermerhorn: Oh, I see. Can you give me just a brief history of your training in terms of instructors and locations? Larry Seiberlich: I started in Judo as when I was in US Army Military Police school in 1958. We were required to learn Judo and some Jujitsu techniques. Following that I trained more in Judo at my next post in Texas and I became a Judo player when I arrived in Korea. I was told my second week there that I would be a body guard for the UN Forces Commander Far East, a four star general, and that they would like me to volunteer to take Tang Soo Do. In the Army, when they ask you to volunteer, they are telling you that’s what you’re going to do, so they enrolled me the next week in Tang Soo Do at Yong San Military Reservation in Seoul. I was with Charlie Company 728th MP’s, so we were the police of Seoul, basically, and Trent Gym was the location on the Yong San Reservation. My instructor was Master Cho Won, Dan Number 80, and my assistant instructor was Shim Sang Kyu, who was a third Dan at the time, and his number was 180. (Master Hanke could fill you in on that because he housed Master Shim when he came to the US.) I trained there and at the Central Do Jang near the RTO in Seoul, and the Army provided me with two hours every day, five days a week, that I could train on my own during my patrol shift, and then I trained in the evening. Sandra Schermerhorn: Oh, great. What motivated you? I guess you already talked about how you got into the Martial Arts, but the question is what motivated you to get into the Martial Arts, but you were pretty much put in. Is that something you were interested in anyway? Larry Seiberlich: Well, as a youngster I was always involved in sports, so I felt that this was another physical activity, and I liked physical activity. I liked to jump high, so this allowed me to jump and people didn’t look at me strangely. Sandra Schermerhorn: And how old were you when you started? Larry Seiberlich: I was 17 when I started Judo; 18 when I started Tang Soo Do. Sandra Schermerhorn: Was there any tradition in your family training in the Martial Arts? Sandra Schermerhorn: You were the first one. 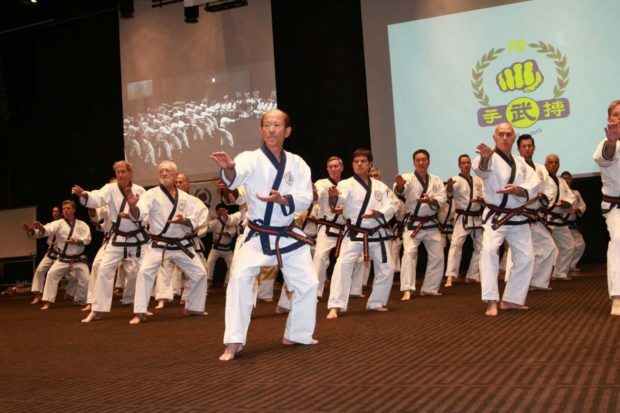 Sandra Schermerhorn: When you trained in the Do Jang in Korea, what was the class like? Larry Seiberlich: It was all American soldiers and we trained in a handball court 40×20, that was my first introduction to handball and it stayed with me the rest of my life. The class was run along the lines of any other class in Korea, because I visited a number of other Do Jangs when I was there. Our instructors spoke very little English. There were a few, maybe they had a 30-word vocabulary of English, but almost the entire class was taught in Korean, demonstration was a big part of it, and the class would last two hours and we would train steadily for two hours. One time we did 400 Yup Podo Cha Gi continuously. I’m not saying that’s good or bad, but just telling what we did. Sandra Schermerhorn: Do you have any favorite story about your early training? Larry Seiberlich: Oh, there are many stories, and I don’t think I have a favorite although when Syngmun Rhee was the dictator of Korea after the Korean War, (the President of Korea), his main bodyguard, a Korean gentlemen, and I would train at Yong San Hill and if I were on MP duty I would stop by and we would do a lot of training, an awful lot of Kyok Pa. Both of our hands were heavily callused at the time. I had half-inch calluses on my knuckles and my hands were callused, and so were his. He had so much callus on his hand, and he did so much Kyok Pa, that he had difficulty operating chop sticks in order to eat, so he was eating with a fork that I got him from our mess. It was strange at the time. Sandra Schermerhorn: When you practiced, what did you hit? Larry Seiberlich: Well, a board with a certain kind of– it was wrapped in different ways, different type of wrapping, and we also hit in a certain kind of sand, heavy grain sand, and gravel, and there was an ointment that we put on the board and on our fists so that it wouldn’t deteriorate the calluses. Sandra Schermerhorn: And then when it actually broke, what did you break? Larry Seiberlich: We broke wood and there was a roof tile that was made out of cement that was on a lot of the buildings. We’d break those tiles; they were slightly curved. You’ll see some pictures of those. In my first demonstration as a green belt at the 8th Army Club, the first one that my class did, Frank Scalercio who was at that time a Cho Dan (he was our class leader), he broke a stack of ten of those roof tiles with his fist, and I broke a shorter stack with soo do. I have a few photos of that demo and there are some in the Moo Duk Kwan history book also. Sandra Schermerhorn: You did that? I’ve seen those tiles, they’re pretty thick, too, right? Larry Seiberlich: Oh, that’s not very big material. I would say it’s the equivalent– a stack of six patio tiles is stronger than ten of those roof tiles. Sandra Schermerhorn: Do you have any memories of your early training partners? Larry Seiberlich: There was Kelly Phalen who was a military policeman with me in the same platoon. He was a good partner. And Colonel Butterwick, he was an older gentleman, a colonel who trained with us. And, of course, Frank Scalercio the Cho Dan. But there were a number like Bill Trogden who I kept in contact with in Washington. Sandra Schermerhorn: Through your training, and there’s probably been some major changes affecting you as a student, you know, training in Korea, coming back, can you talk about some of those changes? Larry Seiberlich: A lot of things changed, our Art changed One thing I noticed when I was in Korea, we were a very large martial art, in fact, at that time, we were the largest karate type art, kick-punch-block-strike art. When I wore my Dan pin in Korea, people would bow, and they’d know, everyone knew what the Moo Duk Kwan was, and it was highly respected. So we were known pretty well in the community by the Koreans just because we were Moo Duk Kwan and I was an NCO in the MPs who they saw quite often. The Art at that time was very powerful, obviously we all know what happened when the Sygmund Rhee was deposed and the new government came in and Tae Kwon Do became the art of choice for the government. I came back to the United States and no one had heard of Martial Arts, so every Martial Artist was probably on square one as far as the American Public, and I tried to teach some of the things that I learned, but there weren’t any Tang Soo Do practitioners in my area and there were very few in the country at that time, but I did teach in a Shotokan School for a little while, and I taught some other people in my small class. I actually applied my Tang Soo Do training many times as a military policeman and as a body guard. When I returned to the States, for 13 months I was at Ft. Lewis, Washington, as a patrol supervisor in the military police, so I used that training, and I also trained Special Ops Forces, where I combined the Tang Soo Do training with three other instructors. One of them was a US Army Ranger, he showed me some Ranger techniques and one was a Ju Jitsu Judo Master. One was a government spook. We combined our knowledge into a comprehensive tactics system and I was able to learn some different techniques. Obviously it has changed. I didn’t have an instructor for a long time in Minnesota. Starting college in 1961, I was busy playing three sports, although I started the Minnesota Tang Soo Do Association December 1962, and it’s the oldest continuously functioning Tang Soo Do (Soo Bahk Do) organization in the country. Then I trained with a number of other instructors in the area, and we were sort of the scouts that came out with the first ideas, so I learned other types of arts and eventually became a Master in several such as Tae Guk Kwon (T'ai Chi Ch'uan). In 1964, Sang Kyu Shim contacted me (Master Hanke had brought him over from Korea), and he suggested I come and train with him, so I went to Detroit, took a second Dan test with him, and I also competed in some tournaments in other cities. Sandra Schermerhorn: How far is that from where you live? Larry Seiberlich: I drove once and I flew once. Driving is about 16 hours. Sandra Schermerhorn: I see, yes. Okay. In terms of the not having the instructor there, certainly that was a challenge for you. Did you have any setbacks in your training due to illness or you said school, did you train during college? Sandra Schermerhorn: Oh, you still did. Larry Seiberlich: In fact, I started a self defense class for women at the college and I had 50 women every time I offered it, and it was good, and I ran a regular Tang Soo Do Class three days a week. I taught college athletes for 12 years, so I didn’t know that people weren’t able to do 20 one-handed push-ups every once in awhile during practice and it was kind of a shock to me to find out that not everyone functioned at that level. My Dan number is an interesting thing. I didn’t know until quite a bit later, that Shim Sang Kyu didn’t turn in the Dan numbers after my Cho Dan test in Korea. He issued me the Dan number of 1815, so I had that number, but he kept the money and he didn’t submit it to Kwan Jang Nim. It wasn’t until Kwan Jang Nim came to the United States in 1974 that I realized that. In 1965 or 1966, Shim SK said, “The Kwan Jang Nim has developed some new forms and I want you to come to Detroit and learn them”. So I did. He had gone to Tae Kwon Do and he taught me all the Tae Kwon Do forms. Later, when I found that out, that was the last I had anything to do with him. Then, I really had no Tang Soo Do instructor until 1974, when the Founder came here and he became my instructor. Sandra Schermerhorn: You kept in touch with the Kwan Jang Nim before he came here? Sandra Schermerhorn: Or how did you know he was here? Larry Seiberlich: I had talked to Norris about something else and he told me that he was coming with other people to New Jersey to meet with Kwan Jang Nim Hwang Kee in November and that I should represent my area. A month later I received a letter from Kwan Jang Nim Hwang Kee inviting me to the meeting. At the time, I had been teaching in Minnesota for 14 years and had schools going and many students, but we had no relationship to Korea because I had no instructor and I had no entre to Korea. So we were completely cut off, and in a way, Tang Soo Do abandoned us. We didn’t abandon Tang Soo Do. 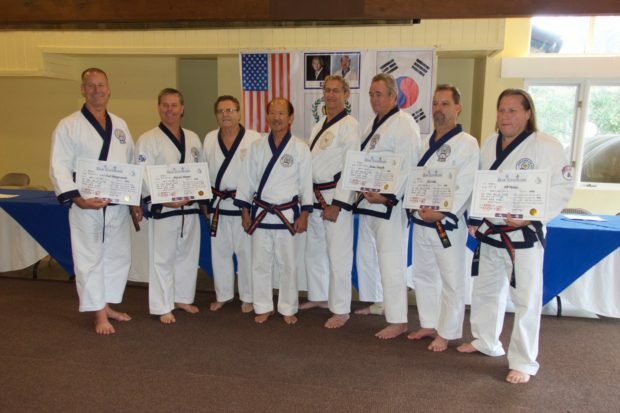 I asked a number of other instructors what they were doing, and they were doing just about the same thing because a number of the Koreans that came to the US told us that they were supporting Kwan Jang Nim. But they weren’t; they were keeping the money and they just defected. So, after awhile we became very suspicious, and that’s why, when we formed the federation, we structured it very carefully so that that would never happen in the future. People like Martinov and Hanke Sa Bom Nims and I, and others throughout the country, had been affected negatively by some of the Koreans that came over and were dishonest about representation. And, obviously, the person who was the most affected by it was Kwan Jang Nim Hwang Kee because they let him down. Larry Seiberlich: Not that disappointed, because then you become disappointed with the subject. If you have a bad teacher, you can still enjoy the subject, but unfortunately, after a few trips through the same subject where the teacher lets you down, you don’t like that subject anymore just because of the relationship with a poor teacher. Sandra Schermerhorn: Yes, understandable, sure. Just going back, we’ll come back to the charter members, but sticking with your earlier training, you said you went to a lot of tournaments. What were tournaments like then? Larry Seiberlich: Well, a few tournaments. I can remember one that I was in and there was a demonstration prior to it in which a number of Martial Arts presented. One man who was about, oh, 6’5”, about 250 pounds, came out and stacked three patio tiles between some concrete blocks and leaned over them, and I thought, “What’s he doing here?” All of a sudden he smashed them with his forehead, and I thought this fellow doesn’t bode well. I wondered who he was going to be fighting with in this tournament, and, sure enough, he was the first person I drew. Larry Seiberlich: I was 6’3”, 215 pounds at the time, but so much smaller than this gentleman, and after his demo, I thought he was a few clicks off anyway. In my match there was a lot of contact. Contact wasn’t acceptable, but after the referee said break each time, my opponent would get in a late hit. And this happened about four times. After the fourth time my lip was bleeding and I had a cut on my ear, and I thought, this isn’t too good. We didn’t wear any pads. I thought I’ll never make it through this. There were a lot of people at this tournament, and some folding chairs in the front row that they put adjacent to the bleachers. and I jumped up and kicked him with a Dwi Dollyo Yup Podo Cha Gi, and I thought I hit him pretty hard in the chest. I flew back like I had hit a concrete wall and landed on the floor and he slowly crumbled into those folding chairs. In a tournament today, obviously, I would be disqualified, but I was just trying to survive. Larry Seiberlich: Well, I hopped up and looked down at him, and thought at least he’s not going to cheap shoot me anymore. And to my complete surprise, they raised my hand before they even attended to him and said I was the winner. So things were a little different in those days. Sandra Schermerhorn: Yes, sir, yes, sir. Did they have form competitions? Larry Seiberlich: Yes, in most tournaments they did, but, as I remember it, we’d do a form and it was very difficult for anyone to judge it because unless your art was represented well in a judging group, the people didn’t understand and they favored their art. I can remember when we first planned the Diamond National, we were trying to recruit people who were fair judges who understood many different Martial Arts, because most people didn’t have the experience with numerous arts. When you’re judging open competition you need to understand the basics of physical movement and what can be accomplished in movement. So it was much more important in those days to have people experienced in those kinds of things. It’s easier to judge fighting because either you see a score or you don’t, whereas the forms were more difficult. When weapons were introduced it was even more difficult. I was in an area where there weren’t many tournaments. We didn’t hold tournaments because there just weren’t enough schools. In 1965, I think we had five Martial Arts schools. I taught at the University of Minnesota, and I taught at Macalester College, and there were three street schools in the metropolitan area of two million. Most metropolitan areas would love that, very low competition. We just had no one teaching. Sandra Schermerhorn: And were they full time schools or part time? Larry Seiberlich: The street schools were full time. There were a few people who operated out of their garage, etcetera, but I probably had more students than most. At the University of Minnesota school, we did a lot of training, just people from other Martial Arts would come and train with me there. Instructors of the other schools would come and train with me, so we all knew each other very well. And that went on until probably 1972 or 1973, when there was enough critical mass. That’s when we first held our first Tang Soo Do tournament. Sandra Schermerhorn: Where was that? Larry Seiberlich: That was held in St. Paul, Minnesota. Our first Martial Arts tournament held in a Karate style art was in 1965. The five school operators put together a tournament, but, again, it was very difficult to get competitors and fair judges. Sandra Schermerhorn: And when they competed did they do forms and sparring? Did they do breaking? 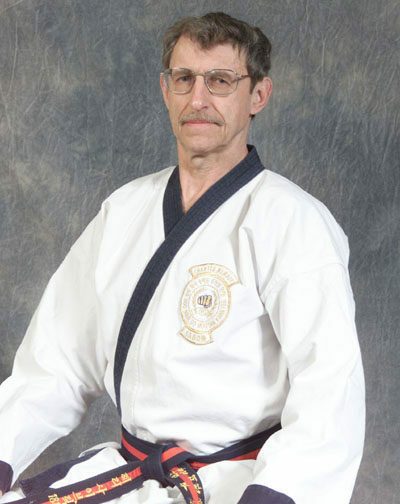 Larry Seiberlich: Occasionally they did breaking, and always in the– when we started the Tang Soo Do tournaments, there was breaking. Our Region is known for breaking in tournaments, testings and demonstrations. Sandra Schermerhorn: What’s your favorite break, yours personally? Larry Seiberlich: Now it’s performing what I call a discretionary break where I take three patio tiles and suspend them between the bricks or whatever, and someone tells me which one they want me to break, and I will break that one and the other two won’t break. Breaking long ago was jump spinning double kicks, and general jump kicking and breaking a lot of things before landing, you know, that type of thing. But, now, obviously, I don’t (can't) do that anymore. Sandra Schermerhorn: Yes, sir, yes, sir. Okay. One other thing. Is there any memorable occurrence at a tournament, something that stuck in your mind, made an impression on you? Larry Seiberlich: Well, I think there were all kinds of events that made impressions on me. I’ve seen so many tournaments that I don’t think I can come up with one. Sandra Schermerhorn: Sure. Okay. We talked a little bit about training, and you explained what class was like. Can you tell me what kind of discipline was used in class? Larry Seiberlich: You mean what type of protocols were introduced or discipline or what? Sandra Schermerhorn: What kind, like push-ups? Larry Seiberlich: I never found that people acted incorrectly. I mean, there was never a punishment thing that I did because the people that I trained were all well disciplined athletes, and they all were there because they wanted to learn. When people strayed from intent and focus, all I did was mention it to them, and if people couldn’t stay with it, they just left, it was just too demanding for them. There was never a case of people not performing. It’s not like teaching eight-year-old kids; it was adults who were very driven. Sandra Schermerhorn: Right. They were motivated; they wanted to be there. When did you see the change in classes where women started training, children started training, families started training? Sandra Schermerhorn: When did that happen? Larry Seiberlich: I didn’t train women. I saw Martial Art as a Moo Do discipline and fundamentally a high level of discipline to develop awareness and an ability to defend oneself, and to maintain discipline in all situations. And I taught it to people so they would survive. It wasn’t for sport; it was to survive. And part of that was doing things which would incapacitate other people. I didn’t teach women until 1971; that’s when the women’s movement was really picking up and a group of women from a commune came to me at the College and said, “We would like to learn this Art.” I said, “Okay, I’ve never done this before, let’s give it a whirl.” But it was difficult for me. It was their general lack of self-discipline and their self-entitlement attitude that created a, what I would call it, a falling out and I excused 17 women at one class session. I said, “You’re through.” Now that I look back on it, I guess I failed. That was the last time that I taught women until 1975, when two women came to the college and wanted to start, and I said, “No.” They said, is it okay if we observe classes? They came to every class, that’s three times a week, for two months. And, finally I decided that anyone with that kind of discipline to sit and watch through that many classes, I’ll teach. One of them became one of the best students I’ve ever had. And that’s when I decided that the art was for some women. One of my daughters is a Dan, and Charlotte Grove, who was that woman, was my daughter’s teacher. I never taught my daughter or my son. But my son was doing jump kicks over the furniture when he was five years old. But now, the last two months in my classes, we’ve been talking about the women’s role in Soo Bahk Do. About 30% of my students are women. But in Soo Bahk Do, there are many physical things that are more difficult for women to do; it’s not easy for them. I’m wondering, and I posed this question to my students: How is the art going to prosper in the future if it doesn't recognize a very powerful and meaningful dimension of our society, women, and accommodate that in our Art? Kwan Jang Nim and I were talking about that this morning. How do we accommodate different groups rather than the 22-year-old men who were the traditional students 50 years ago? What about all of the Senior population that can benefit from some aspects of Soo Bahk Do? Sandra Schermerhorn: Yes, sir, yes. And children make up a big part of the school. Larry Seiberlich: Well, that’s a whole different element. I’ve never taught a child and that’s something I would never do because I don’t feel that the Martial Arts that I know, is appropriate for children. Part of the Martial Art is, but not as I know it. So I’ll let others who have a different view of it, and better skills than I have, do that. Sandra Schermerhorn: Well, speaking of men, 22-year-old men training in the earlier years, and then women coming along and children coming along, too, when you look back, your perception, what were people’s attitudes in general towards the Martial Arts initially? Larry Seiberlich: When I first came to the United States as a Martial Artist, and I came back in 1960, no one knew what the Martial Arts were. And we were considered to be mysterious people, violent people. And as people became more informed about it, by 1965, many police forces were interested in us teaching them, and that’s when I started to work with law enforcement agencies and parts of the Federal government. And we were considered to be highly trained good people. Then, as the flower children came along and the peace movement, there was another stimulus, and we became the bad guys in some eyes and the great guys in other eyes. By 1975 or 1976, there were so many different Martial Arts that featured so many different perspectives, that I think most people understood it wasn’t so much the Martial Art, but the Martial Artist and how each Martial Artist interpreted their training and purpose. And that goes back to the instructor; what kind of values the instructor personally passed on to the students. But then again, it went back to the art itself, and what are those fundamental values that the art describes for the practitioners? But it can be very different from the point of what the Martial Arts founder envisions to what any member actually practices. I think that Soo Bahk Do Moo Duk Kwan is very, very good in presenting and maintaining its values. I was just in the TAC meeting and they were talking about controlling those kinds of value issues and making sure that all members understood them and how they can pass those down so that every member passes on those qualities in the dojang and in his/her life. Unfortunately, many other Martial Arts weren’t (aren't) that way. Sandra Schermerhorn: How about your family’s attitude toward your training? Larry Seiberlich: Well, I was a Martial Artist, and I had taught Martial Arts for four years, before I was married. And I started Martial Arts eleven years before my first child was born. So, really, I was a Martial Artist for so long that it was just part of my life. Sandra Schermerhorn: That’s who you were. Larry Seiberlich: That’s who I was, and that’s what my family saw me to be. Larry Seiberlich: You know, like everyone else, there are many other facets of me, but that is part of it. Sandra Schermerhorn: When you started the Martial Arts, did you talk about what your ambitions were in terms of Martial Arts? Larry Seiberlich: I had none. Sandra Schermerhorn: You were just training. Larry Seiberlich: I was told to be there and, as such, I did what the Military told me, I trained. Larry Seiberlich: It was challenging and it was fun and I used in my work every day. Sandra Schermerhorn: Have you changed over the years for your ambitions? Sandra Schermerhorn: You just like what you’re doing. Larry Seiberlich: I just do it and whatever comes up, comes up. Now I’m doing work with the World Moo Duk Kwan, the international organization, and we’re working with Kwan Jang Nim on that. I carried the faith for ten years when I felt I was abandoned out there, and I just kept going along. Although I trained with other teachers in other arts, I kept the faith of Tang Soo Do, it was on my uniform, the grand master was my model, I followed the book I was given, and it was very important to me. Kwan Jang Nim Hwang Kee came to our class a number of times when I was in Korea and he said and did some profound things, and I felt that he was a great leader. Sandra Schermerhorn: You were going to say something. Larry Seiberlich: I was saying about Kwan Jang Nim that I’ve always respected him highly. I’ve read a lot of his material and I’ve watched him conduct himself. Obviously, the first time I met the man I was 18 years old, and I knew him for quite awhile, not well, but I certainly had been with him. And whenever I had an opportunity at an event where I could see him, I would ask Master WY Chung or others to interpret, and I would ask Kwan Jang Nim a number of questions, just general questions about life, about Soo Bahk Do, about many other things, and he was very informative and he helped guide me in a number of areas and he was a positive influence on me. My father died when I was six, and I didn’t have a father image and as an only child, pretty much on my own, but I became my own person and it was good for me in a way. But I was always looking for people who had some insights that would help me and that’s who he was. Sandra Schermerhorn: –because he was still available. Sandra Schermerhorn: With your training, your Dan testing, when was your Cho Dan test, do you remember when? Larry Seiberlich: Interesting. My Cho Dan test: I took a test at the Trent Gym under Master Cho Won. It was just a test during the class session, and then there was a revolution/civil war in Korea, and no one was allowed out in the streets. The only UN Military people that could be anywhere on the streets of Seoul were US Military Police, so there wasn’t any training. It lasted about two-and-a-half weeks and then people were allowed back. Larry Seiberlich: About a month later, I was told by my instructor that I would be at a test at the Central Dojang. And he said you’ll be there and you will work with the Koreans who are testing there. So I said, “Yes, sir, I’ll be there.” I was asked to fight all the Koreans who were testing and to do all the hyungs with them, so I thought, okay, that’s just part of it and I enjoyed sparring. I was told later that was my Cho Dan test. But I had performed a Dan test at the school for two hours during the regular class. That’s my Cho Dan test experience. May be they both were my Cho Dan test. Sandra Schermerhorn: So you had several challenges in a short amount of time and rose to the occasion. Larry Seiberlich: It seemed to be okay. Sandra Schermerhorn: Yeah, all right, I don’t think many people had Dan tests that they didn’t know they were taking. Sandra Schermerhorn: A really tense time. Larry Seiberlich: Oh, very much so, because the North Koreans and the Chinese could have invaded at any time. On one occasion I was near the DMZ after taking some allegedly secret things up there, and in the night the North Koreans invaded a town nearby. I was with a group of military policemen and convoy vehicles, and we got out and dove in the ditches and a mortar blew one of our vehicles apart. There was a lot of tracer fire; we took a lot of rounds but no one was hit. These raids happened quite often. Sandra Schermerhorn: Do you recall about what year this was? Larry Seiberlich: That was 1960. Sandra Schermerhorn: Yeah, yeah. How long were you in Korea? Sandra Schermerhorn: Thirteen months. So, you answered all the questions about your Cho Dan test. Do you have any favorite memories or anything you’d like to say about your E-dan or your Sam Dan tests and where did you take your E-dan test, were you back in the states? Sandra Schermerhorn: And your Sam Dan test? Larry Seiberlich: I sent film in to Kwan Jang Nim for his review, that was my Sam Dan test. Sandra Schermerhorn: Oh, was he in New Jersey at the time? Larry Seiberlich: I don't remember the situation. Sandra Schermerhorn: That’s unusual, right, right. Larry Seiberlich: At the time I was coaching college football and scouting for the NFL, so I was very involved in activities, physical activities and I held a lot of clinics for professional and college athletes on movement and performance, and Tang Soo Do was just part of it, it all became one thing, movement and discipline and focus. Sandra Schermerhorn: I guess you probably don’t have any training buddies that came up through Dan, E-dan, Sam dan, you were pretty much by yourself. Sandra Schermerhorn: Yeah. How about your Ko Dan Ja testing, where was that? Larry Seiberlich: That was, let’s see, that was in St. Paul, Master Hwang came for that test. Sandra Schermerhorn: What was that like, a day? Larry Seiberlich: It was a test for 4th Dan basically, with the other Dan tests. Sandra Schermerhorn: But it was one day. Sandra Schermerhorn: It was one day. Larry Seiberlich: It was one day. It was at my school. I can’t even remember my 5th Dan test. I can’t remember. Interesting. 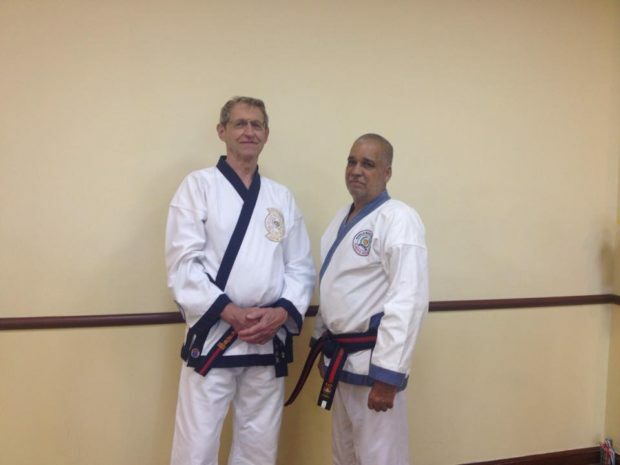 Sandra Schermerhorn: Okay, 5th and 6th Dan testing? Larry Seiberlich: I can’t remember which is which. Now, 7th Dan was in ’91. Seven years from ’91, and it’s ’84. Larry Seiberlich: Okay. That was the first complete Ko Dan Ja session that I attended. Sandra Schermerhorn: Oh, where was that? Larry Seiberlich: That was at Kwan Jang Nim's studio in Springfield; the Headquarters. Larry Seiberlich: That was the second Ko Dan Ja. I was at the first Ko Dan Ja as one of the judges. And then I was a participant in the second one. There were only four of us. Sandra Schermerhorn: Oh, who was there? Larry Seiberlich: Master Moonitz and Master Cortese. Larry Seiberlich: Master Hanke was there as an assistant. We were just talking about that this morning. It was cold, it was in November. And the day of the test, we were sitting with our backs against the wall from six until eight in the morning, meditation, two solid hours. Now none of us were Zen meditators and we had just gone through a number of days of hard physical activity. So we’re sitting cross-legged on the floor, and everything’s gone numb. And the floor is cold. One of our major jobs was not to get hemorrhoids sitting on this concrete floor, and with our backs against this cold wall. Now it’s eight o’clock and time to get up. We started to get up and our pants were frozen to the floor. We didn’t want to tear our pants, so we got a little spit and a little hot air and got our pants loose. There are a number of things I’m not going to talk about that happened during that test, but were really funny. The test started at nine, and it began rather strangely. Kwan Jang Nim came to the door and Master Hwang was with him. Master Hanke really wanted this to be a special entry, because it was the first time that the Kwan Jang Nim had attended the actual Shim Sa. He had held some clinics for us during the week. He didn’t attend the first Ko Dan Ja test. As he appeared in the doorway Master Hanke said, “Sa Bom Nim Kay Kyung Ret.” Well, we looked at him, and jumped up, and I said, “I wonder what’s going to happen now.” And then Master Hanke fell apart for a second, but he recovered quickly as good martial artists do. That’s the way it started. So then we performed from nine until a little after one. It was for four of us, one of the longest– I was asked by Kwan Jang Nim to present everything I new. Defense against a bong, a gun, defense a knife, defense against two people, defensive fighting against three people, and every Hyung that I knew. And all of us did a lot of things, but it was for me like, “Let’s see everything you ever knew.” And I enjoyed it, I was up for it. Sandra Schermerhorn: Well, that was your strong point too, the defensive. Larry Seiberlich: Oh yes I enjoyed that. Larry Seiberlich: Then it came to answering questions. Each of us was asked a question. I was up last, and I’ll bet that Kwan Jang Nim asked me questions for 20 minutes. And I answered every one of them. Then, all of a sudden, he told Master Hwang a question to ask me and Master Hwang said, “The grand master would like to know if you know who…” and he said a Korean name .” And I thought, “Who could this be?” The name sounded familiar so I said, “Sir, I believe that was the military general that defeated the Japanese–” You know, I created a story. Larry Seiberlich: And Master Hwang told him, and Kwan Jang Nim started laughing. Larry Seiberlich: One of his high school classmates. So that told me to learn something from this. I’ve told that to some candidates at the beginning of Ko Dan Ja, to let them know that if you’re cup is empty then just be learning, because there’s going to be something there that you don’t know. Be ready to learn about it. Sandra Schermerhorn: Great, that’s a great story. Larry Seiberlich: On one occasion, I was over at his house and Master Hwang wasn’t there, but his sister was there with his mother. I had to wait for Master Hwang for a couple of hours. So I asked his sister if she would translate. I talked to Mrs. Hwang for two hours, and asked about the many pictures displayed around the house. She told me about when she was married, showing me a marriage picture of the Founder and her. She told me about the Founder’s father, and those kind of things. She was just a super person. I learned so much about the history of that family talking with her. Sandra Schermerhorn: I remember her. My impression, she came to everything, she was there. She was there, and that was nice for me to see. Larry Seiberlich: We invited her to come with him on his first trip when I was Chairman of the Board. We funded that trip for him around the country. And we made sure that she was included, so she came. She came to our Region, and she’s so gracious. Sandra Schermerhorn: Well, this is where I’d like to get back to talking about offices you’ve held in the Moo Duk Kwan, and I think especially maybe the founding fathers Charter Meeting. Larry Seiberlich: Okay, we all came to the meeting in New Jersey. I had received a letter from Kwan Jang Nim inviting me about a month before the meeting and Norris informed me by phone. I met a few people that I knew, and the majority of them I didn’t know. There were probably 28. That’s the first time I saw Master Hwang and Master Jae Chul Shin Master Shin hosted the event at his school. He was a very nice man. There was a lot of discussion and we saw some excellent sparring between Master Hwan and Master Chun Sik Kim. Master Hwang did some techniques that I thought were just fantastic. Sandra Schermerhorn: Did they have a tournament at that time, or a demonstration? Larry Seiberlich: A demonstration and then Kwan Jang Nim held a clinic. There are several pictures taken at the clinic. We did some forms and some kicks and then Masters Hwang and Kim demonstrated some sparring. Every time that Master Kim would do something, Master Hwang would counter effectively, beautifully. But we came together and we talked. Most of the people had real concerns because they would have to give up some of their autonomy, and they were very used to that autonomy. But at the same time, they would gain great connection to the Kwan Jang Nim and to the art, and be taught. But they were cautious and said, “We’ve seen this happen before. Unless the Kwan Jang Nim is really here and he’s on top of this, we don’t want to do this.” A number of them expressed that quite strongly to me. A few days later, after we’d gone home, most of us felt that it was the right thing to do. I remember meeting with some members at their schools around the country trying to convince them to join us. Sandra Schermerhorn: So no decision was made at the actual meeting? Larry Seiberlich: Well, there was a decision to form a group of members to put together a charter and bylaws. And they did. Some of us were not sure at that point, so we said, “We’ll let you know.” We talked often over the next month or so about it. This group kept forming the charter and bylaws, and we kept talking. Larry Seiberlich: No, no. The membership on the committee was about six folks. And they were putting together the Charter and Bylaws of the U.S. Tang Soo Do Moo Duk Kwan Federation. I’ll tell you, the people on that committee were fantastic. They put together a Charter and Bylaws that were very sound. I was asked to review it later and comment, so I know it well. Sandra Schermerhorn: Do you recall who was on the committee? Larry Seiberlich: No, but we have a list somewhere, it’s available. Sandra Schermerhorn: We’ll get it. Larry Seiberlich: I know Master Martinov has been the protector of that Charter and Bylaws. So he was a major player. Charlie DiPierro, is another serious player in that. Sandra Schermerhorn: About how long did that take to finalize and get people on board? Larry Seiberlich: About a year, because we had our meeting in 1975. And then we had our first Official Board of Directors Meeting in June of ’76, at Kennedy Airport. Sandra Schermerhorn: Yes, and you were on the Board at that time? Sandra Schermerhorn: Oh, okay. So you were one of the first board members. Larry Seiberlich: Yes, at that time I was an elected member from Region 7. And then I was appointed two years later by the Kwan Jang Nim, and I became the Vice Chairman. Some of the interesting things about this has to do with fate. I was the Vice Chairman and the Chairman for three years a piece and the acting Chairman on two other occasions. I was on the Board for 26 years. Sandra Schermerhorn: And you always had to travel for them, far. Larry Seiberlich: Oh yes. And the first three years, we weren’t reimbursed for it. It was all out of our own pocket. And we had two, sometimes three meetings a year. We’d go to California, go to New Jersey, go to Pittsburgh, and we paid for it. That’s how we invested in this Organization. I hear some people complaining today because they don’t get the suite. We gave so much at the beginning, and what made us decide to do this is that Kwan Jang Nim would be here and oversee it, and Master Hwang would be here to work it out. With the two of them with us we felt that was a guarantee of success. Sandra Schermerhorn: That you would trust. Sandra Schermerhorn: You would trust them. Larry Seiberlich: We trusted them implicitly. Sandra Schermerhorn: Understandable. How many people were on the board at that time? Larry Seiberlich: Too many, 28. Sandra Schermerhorn: 28. It stayed pretty big for quite a while, didn’t it? Larry Seiberlich: Right. I can tell you how it became less. Do you want to hear that? Sandra Schermerhorn: I don't know. Yes, I’m not sure how that happened. Larry Seiberlich: In 1980 or ’81, we had our what we called our “come to Jesus” meeting, to use a religious metaphor. Unfortunately, as an Organization, we had committed to provide many services. I think there were 76 services. I was the chairman the year we had our meeting. After evaluating our performance and commitments, I was convinced there was no way we could provide all those services.” If you look at the original book, it has page after page after page of what we’ll do, and there was no way we could do it. We were losing money and it was a serious thing, so we had to cut quickly in order to survive. As you know, organizations at first they go through the organizational phase, where they start out. Then they go into a growth phase, and then into their maintenance phase. Well, we were in our organizational phase and we had to transcend into our growth phase. Usually there’s a survival dip in there and we experienced our dip, where you get real close to the edge of survival. We cut down to about 10 or 12 services that we could provide. We also decided that we couldn't pay the way of all these Directors coming to the Board Meetings, because several years prior we’d started to pay their package. We wrote an Amendment to our Charter. I was the first Chairman to try to get a Charter Amendment passed. I couldn’t get enough members to vote on it. The Charter reads that so many members have to vote. We couldn't get that many members to respond, so we couldn't change our Charter. Sandra Schermerhorn: They just weren’t responding. Larry Seiberlich: No. So we changed our Bylaws, and we were able to change the number of Directors. But we had to maintain the two-thirds elected, a third appointed relationship required by the Charter (this ensured that appointed members could not take over control of our Organization). It would always be a members’ organization. That’s what we created from the beginning. Many of our Federation members have served on the Board and have given considerable time and energy to the creation, growth and future of our Organization and the Art of Soo Bahk Do. This has meant are large investment for some. Sandra Schermerhorn: Were all the people who were appointed, appointed by the Founder and then that responsibility fell to Kwan Jang Nim? Larry Seiberlich: Right. All the Appointed Members were appointed by the Founder. The TAC chairman, Master Hwang, was the TAC Chairman for many years before there actually were any members. I think in 1986 or so Kwan Jang Nim appoint eight TAC members and he started training us. Twice a year we would train with Kwan Jang Nim, for several days. Sandra Schermerhorn: When you say “us,” you mean? Larry Seiberlich: Those eight TAC members, the original TAC members. Sandra Schermerhorn: I see. There were eight of– oh, I understand what you’re saying. Yes. Larry Seiberlich: There was just a TAC Chairman for maybe ten years. Larry Seiberlich: He appointed eight Senior members when he thought we were at a level of standardization that made us effective TAC members. Sandra Schermerhorn: So you were a TAC member at that time. Did you have a specific area? Larry Seiberlich: No, no. TAC members serve at the discretion of the Kwan Jang Nim. Sandra Schermerhorn: Have you held any other offices? Larry Seiberlich: Well, let’s see. Sandra Schermerhorn: Board and TAC? Larry Seiberlich: Chairman and Vice Chairman of the Board, Regional Examiner and Administrator, TAC, and SAC. 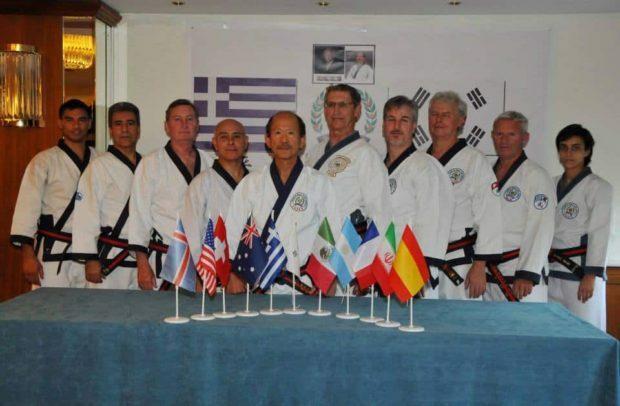 I’m doing a little work now with the World Moo Duk Kwan as the Symposium Chairman. Sandra Schermerhorn: Okay. Can you tell me a little bit about that? Larry Seiberlich: Well, we just discussed that at the Board of Directors Meeting last night. There’s a member (Designee) from each country's organization with a total of 22 countries. We have a Designee from the United States. Because the Designee can make certain commitments on the part of our U.S. Federation, the Federation Board was very interested in who this person was and what the demands would be on that person, and then what issues would be voted upon. So Kwan Jang Nim and I provided that info to the Board last night. We are working on the Agenda for the upcoming WMDK Symposium. We have been working in this area for a number of years, the World Moo Duk Kwan, and visiting people and talking with them and organizing them in Korea, where we met last year. I explained the Robert’s Rules of Order to the Designees, which was difficult in itself, because they have interpreters, and many countries do not use that structure for running meetings. Larry Seiberlich: Just to initiate Robert’s Rules was a rodeo but we’re getting the ball rolling. Sandra Schermerhorn: I see. Brand new stages. Larry Seiberlich: Yes. That’s where we (the US Federation) were 25 years ago. So this is what I’m doing, going various places in the world, and talking to our members. When I go over there for this meeting in October, I’m going to visit the folks in Switzerland and Paris and in Italy. You know, just to say hi, and maybe hold a clinic and that type of thing. Master Hanke goes over there, and he does some things, and he’s been around so, those are the kind of things we do. Sandra Schermerhorn: Come a long way. Larry Seiberlich: Yeah, it seems to. There’s a lot of pieces to it. As Kwan Jang Nim keeps saying, it’s a work in progress, and we’re just getting organized, so let’s not push it too far. Sandra Schermerhorn: Yes sir, yes sir. Okay. We might have touched on this already. If you feel we have, just let me know. What was your best time in the Moo Duk Kwan? Most satisfying for you? You’ve done a lot of things. Larry Seiberlich: You know, there’s so many different times that satisfied me in different ways. Larry Seiberlich: I can’t really say there was any specific time. Many things have made me feel good. The successes of the Organization, the successes of the many individuals in our Organization, and just being together with– you know, I’ve been together with groups of folks that have been so great and inspiring. Sandra Schermerhorn: Do you have any worst time, and what helped you through it? Larry Seiberlich: Well, one thing was the “come to Jesus” meeting, because that could have been the end of the Organization. Larry Seiberlich: Along with that same meeting, there was another chapter that I told to somebody. There was concern that the Korean government may want to steal the Dan Bon book. It was brought to the United States, and it was given to Lyn Stanwich, who was the Chairman the year that we did this transition, when I was the Vice Chairman, but I had to play his role. I had a rent-a-car from the airport, and I picked him up. He gave me this book and said, “I’ve got the book in the car now,” so I put it in the trunk, and I put it under the spare tire. I said, “No one will ever see this. If they break into our room, no problem.” Well, that evening, we went down into the bar and were imbibing a little. At the time, Lyn had serious cancer and was really concerned, but he said, “You know, I want to get this Statement of Purpose of the Federation written. I’ve been working on it.” He read pieces of it to me and said, “I want to put this together. Would you help me?” So we spent about two, three hours in the bar, and after a while the thing magically came together and we read it back and forth to each other. It sounded pretty good. That’s what they use at the beginning of every Board Meeting. Anyway, that was a special night with my good friend Lyn. A very positive thing and we finished it. Then the next morning, I couldn’t find my car in the parking lot. I had a key, and all it said on it was “Hertz” and GMC. Well, there were 100s of cars out there in the two lots of a huge hotel in Clark, New Jersey. And there must have been 300 GMC cars. I couldn’t remember what color it was, and of course it had the Dan Bon book in it. Larry Seiberlich: There was a little panic. But we did get the book when I found the car– we went through the lot, every GMC car. I was saying, “I can’t remember what color it was. I think it was an Oldsmobile, but maybe it was a Buick.” You know, you pick up enough cars at airports, you don’t remember any of them. Larry Seiberlich: That was the Dan Bon book story, the writing of the Statement of Purpose with Lyn story, and the Come to Jesus meeting story — all the same weekend. Sandra Schermerhorn: Okay. Do you have a photograph that you have or that you remember that has special meaning to you? Larry Seiberlich: Well, you know, again, there are so many photographs that have so many meanings. Kwan Jang Nim just sent me a photograph about three months ago. I didn’t have any photographs from my class in Korea. He found one and was kind enough to send it to me. So I sent it to all of my students saying, “You have to see your instructor when he was a green belt.” That’s kind of a special one. Larry Seiberlich: And pictures with Kwan Jang Nim and Master Hwang, and some of the people I trained with in the 60s and 70s. Sandra Schermerhorn: Now, do you have a treasured item from over the years of training? Larry Seiberlich: You know, if I had trained for 15 years, I might be able to come up with one. But I started training now in 1958. In 48 years, you can pick up a lot of artifacts. I can’t think of one. I can list eight probably, but I can’t think of one. So maybe we could put that along with the pictures. Sandra Schermerhorn: Okay, because I was going to ask you if we could have a picture of it. If you had a special item, maybe something you keep in your house or on a shelf? Larry Seiberlich: Well, I have a shelf of some things that I was given or whatever over the years that have– some of them are more special than others, that different people have given me. Larry Seiberlich: But one thing that’s very important, of course, is the book that I got when I received my Cho Dan certificate. It’s the yellow book. Sandra Schermerhorn: I don't know what that is. Larry Seiberlich: That was the second book that the Founder wrote. The Tang Soo Do book from 1958. Sandra Schermerhorn: Is it in Korean? Larry Seiberlich: Yes. It’s about yo big, about that thick. It’s a soft cover. In fact, Kwan Jang Nim called me and said “I think you’re the only one that I know that has one of those.” I sent him the book so he could have some pages copied for a special event. Sandra Schermerhorn: Oh. Well, maybe we can get a picture of that then, that’s special. Sandra Schermerhorn: Wow. That’s great. And he just gave that to you? Larry Seiberlich: Well, each person, when they got their Dan Certificate and their Dan pin, received the book. Sandra Schermerhorn: Oh. Oh, I see. Larry Seiberlich: The Dan pin had your number on it. Sandra Schermerhorn: It did? Oh, that’s nice. Larry Seiberlich: And the book had your number in it. Sandra Schermerhorn: Oh, that is a treasure. Larry Seiberlich: And it’s the second book that Kwan Jang Nim wrote. He had written the Hwa Soo Do book previously. Sandra Schermerhorn: And the one that you have, are there forms in it? Larry Seiberlich: There are pictures of forms and Il Soo Sik Deh Ryun. There are many different areas; one on lifesaving and first aid training. Sandra Schermerhorn: Like first aid? Sandra Schermerhorn: Oh my gosh. Ah. I never even knew there was a book like that. That’s great. Well, we already talked about your remembrance of our Founder. Would there be any other favorite story you might want to tell about the Founder that you know or a favorite story about time you spent with him, other than what we already talked about? Larry Seiberlich: Well, there’s a number of stories that come up. I think I’ll pass on that. Larry Seiberlich: It was ’74, at that meeting in New Jersey. Sandra Schermerhorn: Yes. But you had never met him when you were in Korea? Sandra Schermerhorn: Oh. He was probably pretty young at that time. Larry Seiberlich: Well, he’s five to six years younger than I am. So when I was 18, he was 12 or 13. Larry Seiberlich: But he didn’t train at the places where I trained. Sandra Schermerhorn: When you first met him, what was your impression of him? Larry Seiberlich: Well, I thought he was a great physical performer. I knew he had been in Greece, teaching there in a little dojang. Larry Seiberlich: A few years. Larry Seiberlich: He came to the United States, and he was trying to deal with a new country, new social expectations and us. You could see all the responsibilities, he’s the Grand Master’s son, and all of the expectations. He had a lot of responsibilities and was just trying to get organized. He was a phenomenal martial artist, but definitely under stress. I felt sorry for him the first couple of years. I was talking to your husband this morning and said, “If I ever started a martial art, I’d get myself a Grand Master, and he’d be the guy, and I’d just sit back and watch it.” And your husband said, “And pull the strings like a puppet, right?” I said, “Maybe, but I wouldn’t be a Grand Master.” Because being out there continually shaking hands is very trying for me. I remember one time there were 1,100 participants at one of our Nationals at West Point. Kwan Jang Nim decided to shake everybody’s hand. Larry Seiberlich: And I looked at Master Hwang and he looked at me, Master Hwang new his role and pointed at me and said, “If I'm doing it you have to.” I’d rather stand on the side and let the more outgoing personalities do it. But he has to do it now and he does a super job. I appreciate the man so much, because he takes all the stuff. Often I’m the second guy and all I have to do is stand back and observe and cut the main man's hair when necessary. Kwan Jang Nim is the consummate gentleman. He is a very caring and considerate human being. In 65 years I've met only a couple of people like him. Sandra Schermerhorn: Yes sir. Besides our Founder and Kwan Jang Nim, if you had to choose the most memorable person that you’ve met during your training, who would you pick? Larry Seiberlich: <laughs> I could pick the goofiest in a hurry. Let’s see, the most memorable. You know, memorable is a strange word, because that means you record it in the memory. And there are just so many people that I find to be memorable. But people that I really appreciate and I’m close to, I think Master Martinov is another special person in my life. He endures and he goes along, and he just does it. There are some “memorable people” from the past but maybe not for the best reasons. Sandra Schermerhorn: Martinov Sa Bom Nim, how long have you known him? Larry Seiberlich: I met him in 1972. Sandra Schermerhorn: Yes, Sir. How would you describe him to somebody who doesn’t know him? Larry Seiberlich: A nice, honest, intelligent, straightforward guy that can really mix it up. He knows the art, he knows life, and he’s got a handle on what he’s doing. He has been very successful in many facets of his life and knows how to be physical and mental and spiritual. Sandra Schermerhorn: Oh. Do you have any stories or maybe traditions that he’s passed on to you that you might pass on to other people? Larry Seiberlich: Well I don't think there are any that he passed onto me. I think we created traditions together. Larry Seiberlich: And you have to realize that we’ve always been the seniors. Larry Seiberlich: And so there’s Seiberlich, Hanke, Martinov, Ahpo, you know, the senior group of folks were there together. And if you look at the people that are still with us, charter folks– Shipley’s another one. Now, Shipley hasn’t been around that much of late, he’s been out of the country. And then Fred Kenyon, you know, he was a strong player too. So we were pretty much the folks that were Senior and came along together. Ahpo bought us all blue underwear briefs, with red stripes. Late one night, after some intense social training, we were up in the room, the four of us, Shipley wasn’t there. They wanted me to teach them the knife form, Tanto Hyung. Obviously, there were beds and tables and other furnishings in the room, but we didn't let that bother us. We just stepped up on the bed and on the table while performing Tonto Hyung wearing our Ko Dan Ja briefs. Some of us had knifes but Ahpo was using an electrical hair curler and someone else a comb. Larry Seiberlich: Someone opened the door, and we were standing there. I don’t remember who it was. But he said, “Yeah, this is something I’ll never forget.” It was probably either Masters Donnelly or Shipley. Sandra Schermerhorn: Yes sir, yes sir. Larry Seiberlich: That was a tradition. Sandra Schermerhorn: You created a memory. Larry Seiberlich: Well that was a tradition because it was repeated, and we’ve created a lot of those over the years. I could probably list ten of them, but I won’t, for a number of reasons. Sandra Schermerhorn: All right. Okay. Larry Seiberlich: One interesting time was when the TAC met at Kwan Jang Nim’s home. After the meeting, we all played the traditional “spin the egg” game. We had done several hours of training prior to the meeting. This was a Korean custom. You spin the egg, and if the small end of the egg points to you, you either sing a song or shoot your whiskey. Well, after a while of course, there’s not much singing, there’s just a lot of shooting. The Founder had retired for the evening, and during almost the entire game, Mrs. Hwang was sitting on the arm of one of the player's chairs, with her arm on his shoulder, kibitzing in the game. She looked like she was having the greatest time enjoying watching the young men at play. Knowing she had seen so much suffering during the Korean War made me feel so happy for then. I have a couple of pictures of that somewhere. It was really an important thing for her I think, to be part of this. Everyone was having a good time. So that’s one of the great moments I remember. Sandra Schermerhorn: That’s great, that’s great. Larry Seiberlich: So that was a tradition that we did. It was a positive tradition. The first one I mentioned, it was kind of a neutral tradition; no one got hurt. Sandra Schermerhorn: Okay, up to the present time. Now, what area do you derive the most satisfaction from in your participation in the Moo Duk Kwan, whether it’s training or teaching or doing the things that you’re doing with the World Moo Duk Kwan, what do you get the most satisfaction out of? Larry Seiberlich: I think I can tell you. Larry Seiberlich: I’m satisfied teaching classes. I like to help people and see them learn the Art I am committed to. But I’ve taught all my life. I’ve taught at the university for 25 years, architecture. I’ve taught, you know, many different things. So teaching is something that’s really easy for me, and it’s enjoyable to see people learn. My students are all Senior people, so it’s very easy, there’s a 3rd Dan in the class, and that’s the junior in the class. But then I always train. Every day I do Hyungs, and some Neh Gung. So, I mean, that’s training. That’s my training. I was just fighting with the Region 7 Dan team that’s going to do the team sparring. I was training them. So I get out and do that. And we’re looking for a three-peat now. So if they can win it for the third year in a row, they’re going to be even happier. Not a big deal but a goal, and we all need goals. Larry Seiberlich: There’s working with the international now, The World Moo Duk Kwan, and I think that’s really important. International is what’s going to allow this Art to grow throughout the world. And the discussions we had with the Founder 17 years ago leading to the Mission 2000 Statement, and the ongoing discussions with Kwan Jang Nim, I can see that that’s a very important area, and I want to give as much as I can time-wise. I like Ko Dan Ja just because of the teaching and learning process like Moment with the Masters. Sandra Schermerhorn: What do you like to teach best? Larry Seiberlich: I don't know. This last time at the Hyu Kyun In (Guardians of the Art) Seminars, I taught the application of energy. How to use energy as a Weh Gung, Neh Gung, and Shim Gung, and introduce it into those aspects. Many people think it’s kind of a mysterious thing where you go “Ah ha,” and do a lot of funny things and this energy comes into you. Well, it’s an application in everything you do. So that’s kind of a theme that I’m bringing forth now, because it’s been a mystery and it shouldn’t be a mystery. It's the Natural way — the DO. Larry Seiberlich: In the dark past, 30 years ago, (it was) the jump-spin kicks. Now it’s different. Sandra Schermerhorn: Yes sir. We’ve been looking back a lot, talked about a lot of things. Looking back, is there anything you would do differently? Larry Seiberlich: Sure. Lots of things. Wouldn’t we all? Sandra Schermerhorn: That’s right sir, yes sir. Larry Seiberlich: But I don't think that there’s been anything that I did that has seriously negatively altered the course of things. I mean it isn’t like I made a serious error. It’s just that given the chance again, I probably would have proceeded a little differently. Sandra Schermerhorn: How do you feel about being one of the seniors in the Moo Duk Kwan? Larry Seiberlich: I always have been. Sandra Schermerhorn: Oh, that’s right. Larry Seiberlich: Even when I was 30, I was. Larry Seiberlich: And I haven’t been as Senior as I am now. People have left and fallen by the wayside. But I’ve always been here. Of course loyalty is an important concept in the Asian martial arts. Sandra Schermerhorn: As a senior, what’s something important you feel you can contribute to your juniors? Larry Seiberlich: I've already spent a lot of effort assisting in developing organizations that provide to them, and perpetuate, their chosen martial art. I can show them technique. But a lot of people can show them technique. They can look at the pictures of me performing the Art and say, “Well, that’s nice.” But maybe they can decide. Sandra Schermerhorn: Yes sir. So maybe you’d like to elaborate on this, but how would you like to be remembered? Larry Seiberlich: As someone who has enjoyed life and training in Soo Bahk Do, and has enjoyed as much if not more, passing what I've learned from life and Soo Bahk Do, on to others. The key is to enjoy doing it, having fun, making it fun, or it won't last. Sandra Schermerhorn: Is there anything else that we haven’t covered that you would like people to know? Larry Seiberlich: Just that, well, because of what I last said, martial arts have been very important to me. I live what I’ve learned. I apply it to business, I apply it to my family. I apply it to my spiritual needs — I’m a spiritual person, not religious but spiritual. That’s about it. I fail at times and succeed at others, but I try to follow the way, my Do. Sandra Schermerhorn: Well, this is very moving. I appreciate your time. This is what people need to know, what people need to hear. It’s great. Larry Seiberlich: The Moo Do Chul Hak is the philosophy book written by the Kwan Jang Nin the Founder, and it was originally translated approximately four years ago. Since that time, the Kwan Jang Nim, H. C. Hwang and I have been working many hours to assure that the founders' meanings were appropriately expressed in the wording of the book. It's a very complex book, expressing a novel philosophy of the moo do. And it is our feeling that this book is as much a philosophy book as it is a moo do text and we would like to expose it to the greater circulation of philosophy. My vision is that the Kwan Jang Nim was a philosopher, a phenomenal philosopher, and he used the moo do as the vehicle to express his philosophical opinions and position, and this book captures that very well. Today marks the point where Karen Mead, a student of Jang Sa Bom Nim, who has been working arduously to rewrite some of the areas for us, will meet with us and will finalize the document, so that it can go into publication and the final piece will be ready for our members and for the greater community. Sandra Schermerhorn: Oh, good. The above is an addendum to Seiberlich Sa Bom Nim’s Oral History.